It wasn’t too problematic to predict what Nintendo would showcase heavily on the Wii U upon launch. Sure enough, a certain famous koopa-slaying plumber, arguably the most famous video game mascot of all, made his HD debut in this wildly colourful and vibrant foray. Sticking with the 2D format brought back to the mainstream with New Super Mario Bros. on the DS, the hero brothers’ Wii U entry takes considerable cues from the previous systems’ New Super Mario Bros. Wii. The casual viewer may mistake this for a ported version even. But after playing for a few hours, you realise changes have been made and an element of subtle progression is certainly present. Not a lot I grant you, but as the old saying goes ‘If it ain’t broke, don’t fix it’, Nintendo have stuck by this to the letter, and why not? In general, classic Mario games have all been corkers and with the inclusion of new items and use of the gamepad controller, this is no exception to that age old phrase, despite the odd poisonous mushroom. So what is to be said about Mario’s 18th canonised outing in terms of visual chic? Cutting straight to the chase; it’s good, very good, but could have been a touch better considering the attributes of the console it graces. Initially it reeks of class and years of fine tuning, and Mario fans will have been damp in the pants at the HD glitz of the brothers and their foes. It’s extremely vivid, sharp and striking from the outset, certainly looking better than ever but still embracing the traditional side-on look of the early NES games. Of course, there is a depth to the visuals now, abundant with 3D effects and detailed touches. That said, and this only becomes apparent after several hours of play, it isn’t far enough removed from the Wii version, and it doesn’t achieve the wondrous, nay astonishing platform look that Rayman Legends or the even more recent Donkey Kong Country: Tropical Freeze demonstrate. The Wii U is capable of such beauty, so whilst traditional Mario has never looked finer on screen, it feels just a tiny bit lacking; an expanded, more honed look of New Super Mario Bros. Wii. I really do emphasise the word ‘tiny’ here, as it still is a treat to behold, especially with the sublime lighting effects, intricate moving foregrounds, textures and of course all of the faultless sprite animations. A Massive Star... but we shouldn't stroke Mario's ego too much! If I were to say to you, “hum the Mario music”, chances are you could do this with any of the first five entries. Now you can add this one to that list. The intro theme alone is extremely memorable with its short piano lead riff, made even more pertinent by the title sequence. It seems Nintendo have once again provided their champion mascot with a magical ensemble of tunes to listen to as he rescues the princess for the umpteenth time. Not only have they managed to cook up new hooky jingles that compliment the Mario environment, but have also re-mixed and re-arranged classic riffs from many of the previous games. Something seasoned Nintendo gamers will relish. The always cool and foot-tapping underground/cave beat-hop is there, as well as the ambient but frantic underwater tropes and of course several newly organised boss music ditties, snatched from classic battles such as the Hammer Bros from Super Mario Bros. 3 or the Ghost House theme from Super Mario World. It would also be outrageous if Mario’s atypical jumping sound wasn’t present, as well as a host of new or re-sampled effects to keep things both fresh and original at the same time. 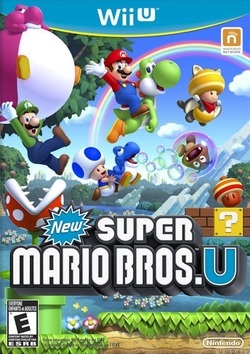 A few tunes are forgettable, but overall the score and sounds of New Super Mario Bros. U are truly magnificent, punctuated by the koopas, goombas and background details swaying and flowing in time with the music. Tremendous. As with such a celebrated series, it comes as no surprise that the gameplay standard is of the highest order. In all aspects of control, originality, exploration, hit-detection and difficultly curvature, is all right on the golden coin. Some parts are pleasingly tough such as is the established Super Mario way, no tame jaunt is this. Revisited features are present but don’t feel overused or tiresome, such as Yoshi, the Ice flower or collecting super coins. The introduction of the Squirrel Suit via the power acorn is excellent, providing a new skill-set for Mario and the player which bares similarities with the old raccoon suit or super cape, but handles differently to keep an ounce of innovation and works really well. Invisible entrances for finding secrets are welcomed, as are the brilliantly placed set-pieces, secret power blocks and enemy surprises. Like Super Mario World, a complete world map makes a return to navigate the levels and paths. Something which I loved about the older titles. Aside from the usual foes such as the King Koopas and Bowser himself making a revisit, a new guy makes his first appearance. Not entirely important to the primary courses, a thief known as Nabbit creates fun side-quests for you to chase him around the map, gaining bonuses upon his capture. The mega mushroom unfortunately has been omitted (this would have looked extra cool in HD), some boss characters come off a little easy to defeat and some levels get hair-pulling frustrating too quickly. But the majority of stages are very well crafted, with many things to uncover and accomplish, leaving a sense of satisfaction once completed. What disappoints slightly are the boasts the game's cover blurb makes about the multiplayer attributes. Up to 4 players can be on-screen at once which is good, as is the unique and smart ability to play as your own Mii in certain modes, but this all comes with limitations. Any players left behind the action get blobbed off and re-spawned rather too frequently and things get confusing and clustered in equal measure. The alternative challenge games provide a bit of short-lived fun, such as the coin battle mode or using your Mii avatar for jokes, but it’s the gamepads usage which provokes the most ambivalent emotions. The idea on paper is great; one player using the pad to interact to the environment; creating blocks or stunning baddies, while the other player/s run as normal. This is an entertaining novelty… for about four or five sessions. It quickly becomes obvious that the gamepad user is doing very little to help or get involved in, it’s more amusing to hamper your playing buddies, but this again gets tedious in little time. It’s clever and innovative, but ultimately pointless. As a single player experience, Mario and co. yet again stamp their authority on the genre, albeit with comparatively aging visuals next to some modern platformers. But the charm is still there, the challenge and fun is still there and the all-important Mario ethos is engaging as always. I feel though more could have been done, the unrealised potential of the multiplayer facets being of particular focus. It’s an outstanding game, no two words about it, it just leaves a very, ever-so-small throb of dissatisfaction in the guts. Mario is King again, but with a few pin-dents in the royal crown.